We had a houseful of friends and family all weekend long and it was wonderful, so that’s a very good reason to be doing the happy dance. But truth be told, I started doing the happy dance at the Fairway supermarket, where we stopped to stock up for the weekend. Fresh fave beans! Fresh young peas! Little red onions! The vegetables all knew it was spring, and Easter weekend, and they were there and ready to be eaten. I love my protein, but knowing that good vegetables are there for eating, just makes me happy. We started on Friday night with those fresh fave beans. Fave is more than one fava bean, at least in Italian. The easiest way to shell them is over steam. 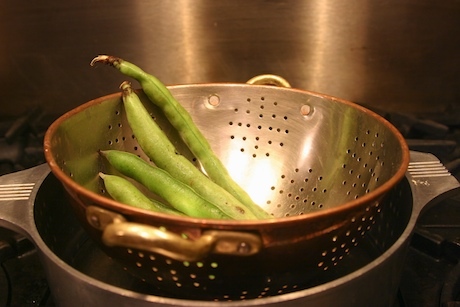 I set up a colander in a pot of low boiling water, and working in small batches, first remove the outer large pod, and then the individual, thick waxy shell around the bean. They don’t require a long cooking time, and unlike dried fave beans, they are not starchy. They are more like eating fresh peas. 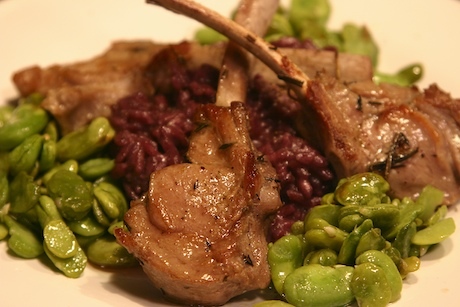 I simply poached them in a little butter and served them along with some itsy bitsy veal chops and a red wine risotto. A fine way to kick off a great weekend.